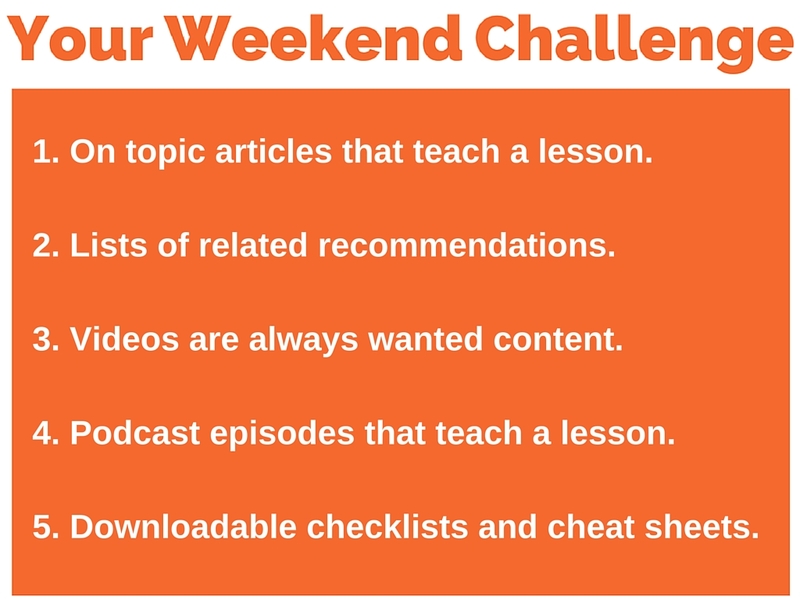 Today is Friday and that means it is weekend challenge time. 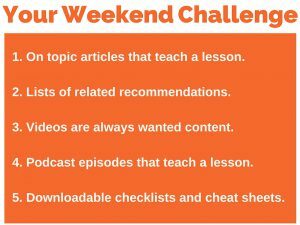 Your weekend challenge this week we are going to be looking at content so that we can figure out what we should be sharing. So as usual, take out your pad or your piece of paper, grab a pen or a pencil and get ready to take notes. Now, this is not just content. These are the types of content that people actually want to read so they will actually share and read it. First off, you need to choose topic articles that teach a lesson. Now please please please, don’t waste your readers’ time; if you waste their time they won’t come back. Don’t go blogging about your family and personal stuff if you’ve got a business blog. Now if you have a family blog, that’s different. If you’re trying to make money then you want to impress the reader, don’t waste their time with stories about you and your kids if it’s not appropriate. Now if you’re a mom blogger or a dad blogger that’s slightly different, but otherwise they are not interested. Occasionally inject a bit of life and a bit of humanization into it, but don’t go on all the time. They’ve come for information and it’s not about you it’s about them. Make sure your topics are teachable so that by the time they finish reading it, they’ve learned something, and it was time well spent. Make it thorough so they fully understand, and make yourself to be the expert because you are, so show them everything you know. They will take the time to read a long article if it’s good. Now, let’s talk about lists of related recommendations. That is, “listicals” which is a great term for it, but you’ve seen them everywhere such as Buzzstream and Buzzfeed. You will see , “51 Ways to Write Content That Sells”, “27 Sites to Find Pinnable Images” “32 of the Best Bloggers to be Following” etc etc. Now a lot of the aficionados of top content hate these things because they describe them as low quality, however, the rest of us, we love them, and that’s why they’re shared. That’s why you see them so often because people share them. And if you are the writer, you are getting in front of a bigger audience. When people share, they expand your reach to their audience, multiply it by their audiences times yours, massive, so write stuff they want to share. When they come back they will find the other good content in between them, obviously, don’t make every article one of these. We all love it. We love to be told who to follow what to do. We love them. Don’t forget that YouTube is free. I’m doing this on an iPhone, my iPhone that I had in my pocket, that is now on a tripod. Yes I am at the beach and yes it’s freezing cold by the way, but it’s put on YouTube, and that YouTube video is free. It then gives you a little “embed” code which you just copy and paste on a page on your blog or on your website and it pops the video up for you, so it’s then on YouTube and it’s on your blog. You can then upload the video to Facebook; if you do that by the way, please don’t add the YouTube one to Facebook, upload the video to Facebook the same way you did to You Tube. Facebook prefers it because they are rivals, so remember that. A lot of people want to watch videos sometimes when reading is just too much. They can’t be bothered to read, they are tired, and they just want to pull out an iPad and watch videos. So what better than to explain it to people how to do stuff, how about narrating some of your best blog content into a video? People can then listen to it. Clever eh? You could even make that into a podcast. Gosh, do you see how this works? So notice that when I do my podcast I’m not chatting about what I had in Starbucks or the coffeehouse I visited in Deal. I’m not going to talk about that, I’m not going to walk along the beach and tell you about that, those things are for Periscope, Life Stream, and the more real life raw image type stuff. By the way, if you want to watch “Periscope” you can catch me at periscope.tv/marketingowners. To see all my older scopes, you just visit katch.me/marketingowners, you can see them there as well and you’ll catch my periscopes and that’s where I talk about the real, you know, just me and bits and pieces. But here, with the podcast, you need to make them short, make them sweet, teach them on something they can listen to while they are cooking their dinner, or eating their breakfast, on the way to work, on the train, while they are shopping around Wal Mart, things like that. People love summaries, there are entire websites where people summarize books, these things people pay to be members of because they can’t be bothered to read the whole book; or before they commit to reading the whole book, they’d rather hear that someone tell them it’s worth their time. How about you doing that? If you go to marketingforowners.com/guides, you will find reams and reams and reams of checklists and cheat sheets which are summaries of long posts that we wrote that are on one page or two pages and they are totally free. Knock yourself out, download as many as you can. By the way, if you are a member of the Owners Club, you don’t have to do anything, it’s a one click download, otherwise you just have to enter your details just to get them and will be delivered to your e-mail. Your choice, both ways are free. You want to make your images look good, make them big enough to be shared, which means no thumbnails. Your website should reduce the image to the right size. If you use a proper website like WordPress, it will reduce them on the page to the site so for the display but in the background the image underneath is still the giant one. If people are going to pin them, go to someone like byregina.com, and look at her images, look at her posts, see her shares and see how many of her images have been pinned. Make them shareable. Go and see Rebekah Radice, look at her images because they are excellent. People want to share stuff, because it makes them look good. You provide the content, they look good with all their friends. You know when you sit around at a dinner party and someone says “Anyone know of a good dentist?” Everyone tells them of the best dentist, everyone wants to look good. “Anyone know of a good wine that will go with fish?” Someone will know that one. 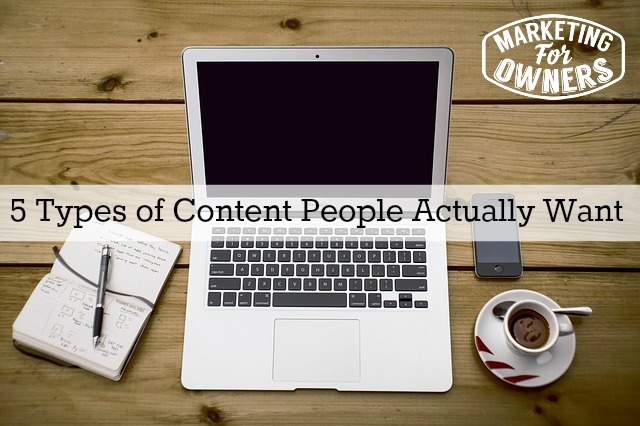 People like to look good, so make your images shareable, they share your posts, they share your content. And there you have six, and the reason for six when the title said five, over deliver! That’s it! Have a fabulous weekend and I hope it’s not as cold where you are, I’ll see you on Monday.